April is Rosacea Awareness Month which makes it a great time to learn more about this skin disease that affects more than 16 million Americans. Rosacea is a common skin condition that causes redness and visible blood vessels in the face. It may also produce small, red, pus-filled bumps. Symptoms may flare up for a period of weeks to months and then go away for a while. Rosacea frequently begins as flushing or blushing easily and can expand to redness in the middle of the face. This redness may gradually spread beyond the nose and cheeks to the forehead and chin. It can even spread to the ears, chest and back. The early signs of rosacea are somtimes ignored because people often think it is temporary. When it first develops, the redness tends to come and go. Many people may think it’s just flushing that lasts longer than normal and that the visible blood vessels are just an inevitable sign of aging. 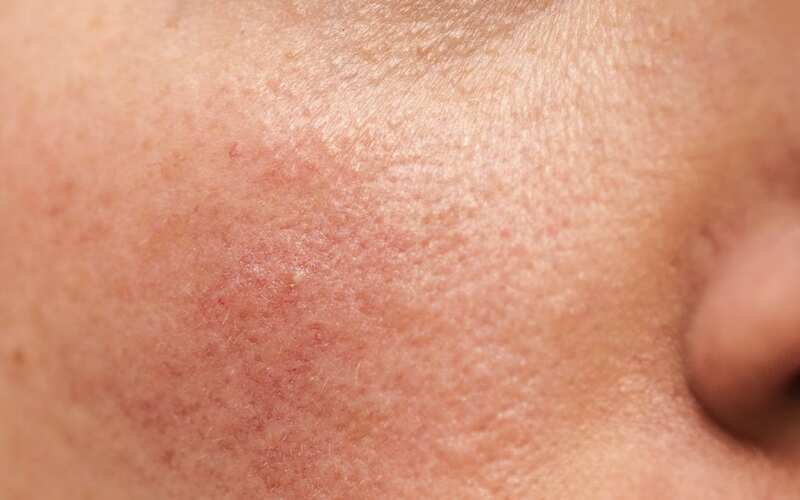 Fair-skinned adults between the ages of 30 and 50 may be at the greatest risk; however, people of all races and ethnic groups can develop rosacea. It affects men and women of any age, and even children. Rosacea can be associated with menopause, and women are affected more often than men. Women approaching menopause may notice an extreme sensitivity to cosmetics and skin-care products, which can be symptoms of rosacea. Both men and women may notice that a particularly embarrassing or tense moment triggers flushing that lasts longer than normal. While there is no cure for rosacea, dermatologists usually recommend a combination of topical creams, lotions, foams, washes, gels and pads that contain a topical retinoid or benzoyl peroxide. These treatments help prevent rosacea from progressing and/or reduce the acne-like breakouts, redness and the number of flare-ups. It usually takes three to four weeks to see improvement with more improvement occurring in about two months. Practice good sun protection. Sun exposure seems to be the most common trigger. Stay in the shade when possible, limit exposure to sunlight, wear protective clothing and use nonirritating broad-spectrum (offers protection from UVA and UVB rays) sunscreen with SPF 30 or higher. Reapply sunscreen every two hours. Avoid spicy foods, hot drinks, caffeine and alcoholic beverages. Protect your skin from extreme temperatures.Extreme hot or cold temperatures can exacerbate rosacea. If you exercise, you should do so in a cool environment and make sure you do not overheat. When outside, especially in the winter, protect your face from cold and wind with a nonirritating scarf or ski mask. Avoid rubbing, scrubbing or massaging the face. Avoid cosmetics and skin care products that contain alcohol or other irritating substances. When using hair spray, avoid contact with facial skin. Keep track of flare-ups.Write down what foods, products, activities, medications, etc. that cause your rosacea to flare-up. This can help you identify your triggers. Don’t try to self-diagnosis or deal with rosacea yourself with over-the-counter treatments. Some over-the-counter treatments can make your rosacea worse. And, the longer you wait to see a doctor, the more difficult rosacea can be to treat. So, if you think you have rosacea or are experiencing any of the symptoms above, schedule an appointment with your Water’s Edge Dermatology provider today. Click here to Request an Appointment or call 877.533.8214.